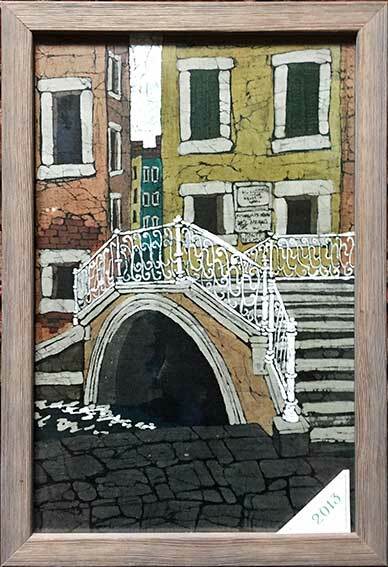 This is a beautiful little bridge in the Santa Croce area of Venice, with its intricate railings and worn steps, in reality it has black railings. To achieve that in Batik would have been virtually impossible, as I would have had to wax the spaces between each overlapping s-shaped railing. I know it was a bit of a cop-out but I decided to wax them in at the beginning to be white, in order to do them justice. I have deliberately kept the houses plain, laying on the wax with a wide brush, to contrast with the delicate intricacy of the iron railings of the bridge. The LED lights behind the picture follow the curve of the bridge, then go upwards to light the sky. The area beneath the bridge and the flagstone pavement has no light strip behind. Thus your eye is drawn to the bridge itself and on down the alleyway opposite, to highlight what I think is the Grand Canal at the end. The back-lighting is an integral part of the whole design.